Here’s a stat—a quirk?—that has very little to do with anything else in this blog but is too amazing not to lead with: In this series, Sidney Crosby has been on the ice for all 10 of Pittsburgh’s goals. The Penguins’ 3-1 win Thursday ties the series with Washington at two games apiece, and it’s time to marvel once again at coach Mike Sullivan’s line shuffling. Not necessarily that young Dominik Simon, moved to Crosby’s line, was excellent last night—he was fine—but that it’s even an option for Sullivan to take a guy who made his NHL playoff debut two weeks ago and has had four healthy scratches this postseason and put him on the top line in a crucial game. The Penguins have an embarrassment of riches on offense, especially down the middle. You can seemingly pair Crosby (and Jake Guentzel, who is doing incredible things—41 points and 23 goals in his first 35 career playoff games, which puts him on lists with a whole bunch of hall of famers) with just about anyone, and it seems to work. The line scored two last night, both by Guentzel, both assisted by Crosby. Everything flows from there. Last night’s Hagelin-Malkin-Hornqvist line is as good as just about any other team’s first line. Phil Kessel, who had 92 points this season, is on the third line. Derrick Brassard is somehow a fourth-line center here. This team has its flaws and its down stretches—the fact that they haven’t scored without Crosby on the ice this series would seem to be a big one!—but even a Penguins team on a relative down year has enough talent to have as good a chance to win the East as anyone. But it all comes back to Crosby. OK! That was a long digression from what was supposed to be a blog about Pittburgh’s second goal. Maybe the goal is the digression. Yeah, let’s go with that. 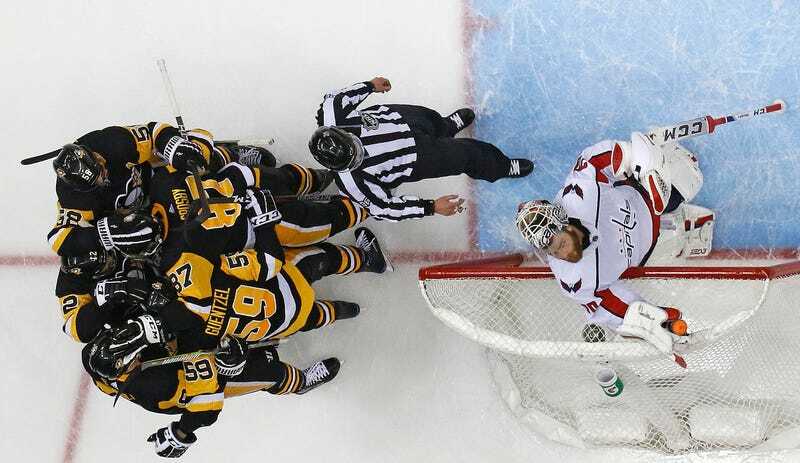 At 17:31 of the second, the Penguins broke a tie with a power-play goal that Evgeni Malkin described as “garbage.” He rang a shot off the far post, but the puck slithered beneath Braden Holtby and peeked out on Malkin’s side of the crease. He flung his entire body toward it and poked it just over the line before Holtby batted it out. Because nothing in this series comes easy, officials reviewed the play and fans everywhere screamed “PARALLAX,” only some of them ironically. Malkin said he was expecting the worst. The NHL’s situation room in Toronto initiated a replay review, however. During the delay, Sidney Crosby told Malkin the replay showed a good goal. Malkin still was skeptical. But then Barry Trotz challenged for goaltender interference, which there definitely wasn’t, but who even knows these days? The officials reviewed it again, and the goal remained good. Despite Malkin’s physical theatrics, there was an unsung hero on this play, and Malkin was happy to give credit. And indeed, watch Patric Hornqvist, No. 72, do the hard work to chip the puck free and, in the smallest of windows, flip the puck outside to Malkin. The goal was a big one, and not just because it was the game-winner. The Penguins, if they are to advance, are going to need secondary scoring beyond Crosby and Guentzel and Hornqvist, outside of whom no forward had scored an even-strength goal this series. 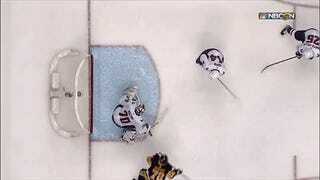 Hornqvist, getting dropped to the second line, earned Malkin a goal to break that string.